This lesson provides information on climatology—what it is, the factors that create an area's climate, and the sources and uses of climate information. Focused specifically on tropical Pacific islands, the content covers the key features influencing climate in that region and includes examples for four locations distributed across the tropical Pacific Ocean, both north and south of the equator. 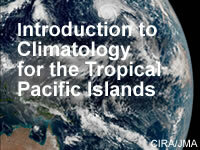 The lesson provides a basic introduction to tropical climatology intended for a wide range of users, from meteorology technicians, forecasters, and scientists, to those in industries or sectors influenced by climate. Lesson was boring but informal. It is good but needs more time to read and go through. Need more time to understand more of the contents. Very well structured and informative. Highly recommended. This is a very good plat-form for improving one's level of understanding and depth regarding a certain specific module. This is a challenging excercise and it contribute tremendously on the knowledge of climate properties. Very useful piece of information and I learned a lot from the way the lesson is outlined and most of all the quiz questions are very interesting. I learn a lot from this informations as I read through the notes and then answer the quiz. I well understood this book of introduction of climatology for the Tropical Pacific Island. these are excellent trainings, im honored to be able to be taking these courses. It's an ideal method for learning. the metEd lesson is one of the best lessons as it expose us into hematological knowledge specifically over pacific region. so I highly emphasis other meteorologist to go through the course for building compitence.